Developing relationships with providers for referrals to and from programs including detox, residential and outpatient treatment facilities, hospitals and health care settings, as well as first responders and emergency rooms. Providing follow-up and care coordination among different sector services. Adjusting plans based on ongoing evaluation with participants. Providing overdose prevention and education. For an overview of the different services, click here. GRASP was created to provide support, compassion, and, most of all, understanding for people who have lost a loved one from drug use. Many times, friends and family members who are left behind find their grief to be unmanageable. Hopes for a loved one’s recovery have been dashed, and feelings of loss are overwhelming. Support groups for those grieving the loss of a child, spouse, or other loved one from a disease or an accident seem readily available. But, there is little help for those who have lost someone from addiction/substance use disorder or the misuse of drugs. We seek to fill the void as GRASP is for anyone who has lost a loved one and wants to connect with others sharing a similar experience. The Charlestown GRASP Group is held on the third Tuesday of every month at the Charlestown Health Center - 73 High Street - in the basement conference room from 6 to 7pm. If you have questions regarding the Charlestown chapter, contact Shannon Lundin at 617-320-9058 or smlundin@partners.org. You can also find a list of all GRASP chapters, other resources, and subscribe to their mailing list at www.grasphelp.org. 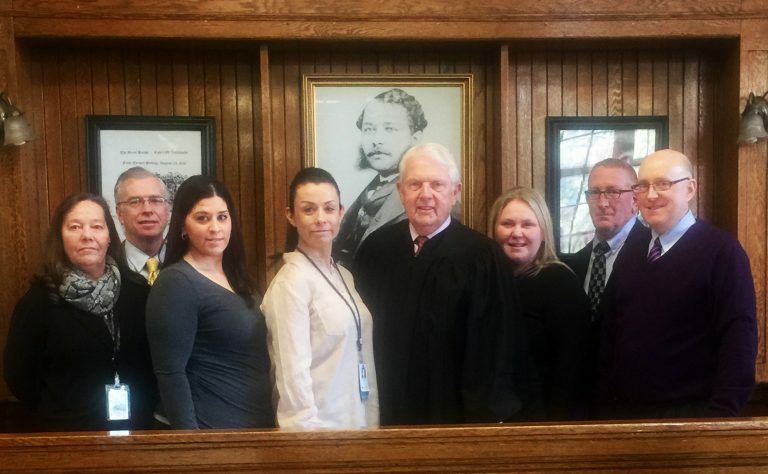 The Charlestown Division of the Boston Municipal Court (BMC) and its Probation Department, which established the Charlestown Addiction Recovery Treatment (CHART) Program in partnership with the Charlestown Coalition, has been in full operation since May of 2013. CHART is a specialized court session which assists individuals on probation who suffer with chronic Substance Use Disorders. These individuals voluntarily participate in court-stipulated drug treatment as an alternative to prison. The program follows a successful drug court model in Chelsea, where the sentencing includes intensive court supervision, mandatory drug testing, substance use disorder treatment, and other social services as an alternative to incarceration. A US Department of Justice drug court study found that, when appropriately implemented, drug courts can reduce recidivism, decrease the chances of future drug use, and promote positive cost-saving outcomes. An updated Massachusetts detox bed list is posted to The Charlestown Coalition’s Facebook page on a daily basis (even on weekends). While the list does not guarantee placement, phone numbers for the various facilities are provided. Patients are advised to call before going to the facility.